It turns out that I couldn’t find any stories of good, bad, or ugly collaborative direct mail. I did, however, learn of several things that had been tried. Judy Anderson at Community Consultants in New York responded that several land trusts in Connecticut are working on a collaborative case statement. Judy also told me she knows of several examples of land trusts using the same staff person to handle their membership programs and direct mail. Rupert Friday at the Rhode Island Land Trust Council called and talked about an abandoned project in Rhode Island several years ago. The idea was that several different land trusts could merge their membership data into one larger database. The database would be chosen to bring flexibility and services to each land trust superior to that which they would be able to afford on their own. A centralized system could also be reliably backed up, periodically checked for bad addresses, and regularly “serviced” with software updates and so on. Further, the door would then be open to other collaborative work such as combined renewal programs, standardized newsletter and E-News programs, and other routine communications. Even if the land trusts never collaborated on anything, sharing a database would open the door to shared training and support. The experiment never really got started. Rupert could not find enough land trust interest to overcome the distrust of how the data might be misused. As it turned out, an even greater impediment was the work involved in standardizing how each land trust’s data was organized. Beth Hershenhart, founder and CEO of Innovative Resources Group, Inc, emailed me about a collaborative program she has been involved with in New York. Under this program, several organizations (not land trusts) have combined their mailing lists by sending them to a wealth screening organization. The combined lists were enough to make the screening work affordable for all without risking actually sharing each other’s lists. The organizations then collaborated on the design and production of a direct mail piece featuring basic planned giving information to a smaller group the screening service identified as likely candidates. Though the results may not be known in full for some time, the results have already yielded planned giving leads representing several hundreds of thousands of dollars. None of these projects was exactly what I was looking for, but each was provocative. Why aren’t there more numerous and better examples of land trusts beginning to collaborate and share services? Where are the barriers? How can we help? 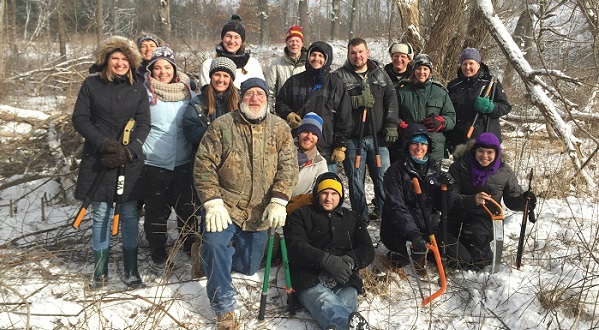 Photo credit: Martin Luther King, Jr. Day Volunteers at Bow in the Clouds Preserve courtesy of Southwest Michigan Land Conservancy.